A great collections of shorts that shows the company developing its talent and techniques. Pixar Animation Studios has been the most consistently creative and innovative production company over the past twenty years. The company was originally a division of Lucasfilm until 1986 when Steve Jobs bought it after he left Apple. Pixar's eight feature films, from 1995's Toy Story to 2007's Ratatouille, have a theatrical worldwide gross of over $4 trillion, and that doesn't taken into account the usually more lucrative DVD market. Pixar's success over the years resulted in The Walt Disney Company acquiring them in a stock transaction worth over $7 billion. This DVD collection presents 13 shorts by the Pixar team, 12 with commentary tracks. Industry people and film-festival attendees primarily knew the early shorts from the late '80s. Post-Toy Story, most of these shorts have been seen in front of Pixar theatrical releases and available on other Pixar DVD releases except for "Red's Dream." "Andre & Wally B" from 1984 is their first film as a group under the Lucasfilm Computer Graphics Project banner. It is rather simple as there's not so much of a story as there is one joke, and it looks more like a test of 3-D shapes. It was shown at SIGGRAPH, the convention for the Special Interest Group on Graphics and Interactive Techniques, and was very impressive for the time. Aside from becoming Pixar, 1986 saw the creation of the landmark short "Luxo Jr," whose title character became the company's logo. The short is a few seconds longer than "Andre," but it is in a completely different league. The amusing story is about a young architect's lamp playing with a ball. Even though they had no faces to express themselves, the personalities of the lamps shown through their movements. The detail is astounding, in particular the cord rippling. This was the first computer-animated short nominated for an Academy Award. Years later it was released in front of Toy Story 2 and appeared on that film's DVD. "Knick Knack" (1989) is Pixar emulating a Warner Bros. cartoon. It tells the story of a snowman inside a snow globe tries to break out and meet a female figurine from another souvenir item. The short is very funny and featured music by Bobby McFerrin. The details of the snowflakes floating around the globe are amazing. It appeared in front of Finding Nemo and on that DVD, although the female characters breasts were reduced. Their original appearance can still be found on the Internet. After four "Luxo Jr." shorts were made for Sesame Street, which can be found in the bonus features, Pixar took a break from making them as they focused on their first feature Toy Story. Eventually the shorts returned in 1997 as it allowed the company to develop new talent and new techniques. Some shorts were released with films and their accompanying DVDs, while others were made for the DVDs featuring characters from the movies. "Geri's Game" by Jan Pinkava saw advances in the design of humans. It was paired with A Bug's Life and won an Oscar for Best Animated Short Film. "For The Birds" by Ralph Eggleston also won an Oscar and was paired with Monsters, Inc. Mike and Sully from that film starred in "Mike's New Car." It is the first Pixar short to utilize vocal performances. "Boundin'" by Bud Luckey makes a great use of color in its desert locale. It is slightly different than their other shorts, telling a moral tale rather than being comedic. It was paired with The Incredibles. "Jack-Jack Attack" could very well have been a deleted scene from that film as a young babysitter deals with the super-powered baby. The colors and shadows are very good, and humans look more realistic. The quality of the images improves again in "One Man Band" as two street musicians compete for a young girl's coin. The detail and colors are fantastic. It was paired with Cars. Characters from that film appear in "Mater and the Ghostlight," Lasseter's return to shorts. It is an amusing tale about a prankster getting a taste of his own medicine. The DVD closes out with "Lifted," which was paired with Ratatouille. The comedic short is the directorial debut of award-winning sound designer Gary Rydstorm. All the shorts except "Jack-Jack Attack" have commentaries. John Lasseter, Bill Reeves, and Eben Ostby provide the commentary for the '80s shorts. Most of the remaining commentaries are by the directors. Composer Michael Giacchino joins in on "One Man Band." He was brought in during pre-production because the music was so instrumental to the short. The one exception being "Mike's New Car" where the co-directors' children provide a commentary of what they see and how they think the process works. There is also a 24-minute documentary, "The Pixar Shorts: A Short History," that is a great look at the history of the company and computing in general over the past 20 years. Any serious fan of Pixar knows their work, both shorts and features, has always been self-referential and filled with in-jokes. If the viewer pays attention, he'll notice Tin Toy makes a cameo under the farmer's bed in "Lifted" and one of Jack-Jack toys is Luxo Jr.'s ball. Geri went on to appear as the toy restorer in Toy Story 2. The joy of discovering the rest are yours. I found two Easter Eggs. On the main menu, underneath "Boundin'" a Luxo Lamp icon appears and reveals an early pencil test of "Luxo Jr." from Sept 1986. On the Audio Options menu, down in the right corner a flag icon appears giving access to a 13-second test to create motion, shading and lighting to make water, techniques that were refined and used in Finding Nemo. 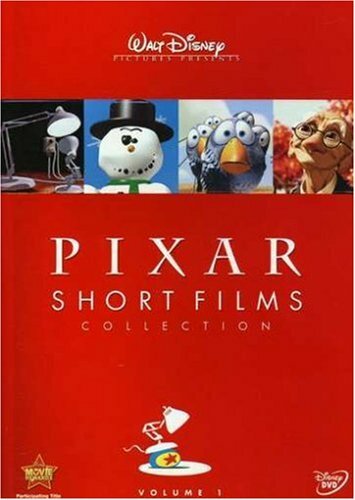 Pixar Short Films Collection, Volume 1 is an impressive body of work that deserves to be in the library of animation and movie fans for both its historical significance and its specatacular quality of entertainment. Understandably, some might already have a number of these shorts already in their collection. For them, the DVD is at least worth a rental for the bonus features and new commentaries.